More than three-quarters of Britons say they would not recognise signs of skin cancer, a survey by the British Association of Dermatologists suggests. The disease now causes about 2,100 deaths annually in the UK. The BAD said that while 95% of people it surveyed knew the disease was becoming more common it was concerned that they appeared to be unaware of the link with sunburn. The poll of 1,018 people last summer is being published in Sun Awareness Week. The initiative aims to educate the public on how to check for skin cancer and provide information on sun protection techniques. 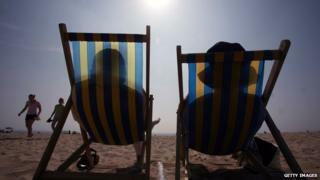 Skin cancer rates in the UK have been increasing since the 1960s, with cheaper foreign holidays and the popularity of outdoor activities thought to be responsible. According to the BAD, more than 250,000 new cases of non-melanoma skin cancer - the most common type - are diagnosed each year, in addition to about 13,000 new cases of melanoma, the deadliest form. The survey suggests that 85% of people are worried about the potential impact of the UK climate on skin cancer. Some 40% said they never check their skin for signs of the disease; 77% do not feel confident that they could recognise signs of a melanoma, and 81% do not feel able to recognise signs of a non-melanoma skin cancer. Media captionDr Walayat Hussain: "Early detection of skin cancer is so, so critical"
The risk of developing melanoma is said to be more than doubled in people with a history of sunburn. And Johnathon Major from the BAD said it was "shocking" that 72% of people surveyed said they had had been sunburned in the past year. He said: "This is a reflection of poor sun protection habits. People underestimate the damage that sunburn can do to their skin, and many think that skin reddening is just a harmless part of the tanning process, rather than a sure sign that you have damaged your skin irreparably." While sunshine does have health benefits and aids the body's production of vitamin D for strong and healthy bones, dermatologists say it is essential to use a sunscreen, and spend time in the shade and cover up with clothing when outdoors.